How can I visit the Brühl Palaces Augustusburg and Falkenlust? Join one of our public tours to Augustusburg Palace starting throughout the day and included in the price of your ticket. Admission to Augustusburg Palace is by guided tour only; having a tour on your own is not possible. Visits to Falkenlust, however, are generally at your own pace. We can also arrange a guided tour of Falkenlust, however, in German only. Please call +49 (0) 2232 44 000. In both palaces we offer audio guides in Chinese, Dutch, English, French, Italian, Japanese, Korean, Polish, Portuguese, Russian or Spanish (1.00 € additional charge). Groups are asked to book in advance for reasons of limited access to the rooms. Please call +49 (0) 2232 44 000. It is possible to arrange your tour of Augustusburg Palace in English or French. On request other languages may be available. A guided tour of Falkenlust, however, is available in German only. 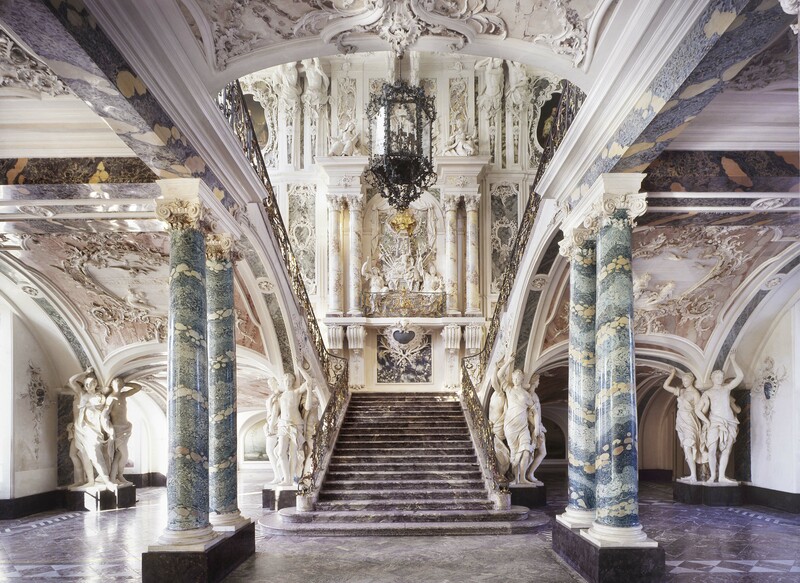 Can I visit the Brühl Palaces using a wheelchair, walker or rollator? At Augustusburg Palace it is partly possible. Please call +49 (0) 2232 44 000. At Falkenlust it is, unfortunately, not possible. Do I have to book in advance or reserve tickets for a visit to Brühl Palaces? Individual visitors or families do not have to reserve tickets. At Augustusburg Palace public guided tours that you can join start regularly during opening hours. Visits to Falkenlust may be visited without a guided tour. Groups are asked to book in advance for visiting the palaces. Please call +49 (0) 2232 44 000. Where can I leave my push chair/stroller during the time of visit? Please kindly note that push chairs or strollers cannot be taken into the palaces due to their sensitive historic floors. You can comfortably leave your push chair/stroller at the entrance area during your visit. Is it possible to cross the palace gardens by bike? The access of vehicles of all kind is prohibited in the gardens and park ground, including bicycles. We offer bicycle racks at the entrance gates for you. You are, however, allowed to push your bicycle through the park. Vehicles you see crossing the park are on duty having a special permission by management. Is it possible to take pictures in the Brühl Palaces Augustusburg and Falkenlust? No. Photographing is not allowed inside the palaces, including group tours or wedding pictures. Is it possible to use a drone to take aerial photographs? No. Any operation of unmanned aerial systems (drones) or other remote-controlled flight models is generally forbidden within the entire area of the palaces Augustusburg and Falkenlust and over the gardens and park grounds. Can we have our wedding at the Brühl Palaces? No. Augustusburg and Falkenlust Palaces are exclusively maintained for the public as museums. Wedding ceremonies or other kind of events cannot take place here. Is it possible to take wedding pictures in the gardens and park grounds? Yes. If it is for private purposes only, photographing is allowed in the gardens and park grounds. We kindly insist on you keeping off the grass, the flower beds and fountains in the French formal garden. Commercial photography is not permitted and requires a special grant by management. Please note that any operation of unmanned aerial systems (drones) or other remote-controlled flight models is generally forbidden. Is there a possibility to host events in the gardens and park grounds? No. The Brühl Palaces are exclusively maintained for the public as museums and cannot be rented as an event location. Is it possible to have professional shootings or filmings in the gardens and park grounds? No. The Brühl Palaces and their gardens and park grounds are not available as location. Exceptions are made for shooting documentaries about art, culture or history of the both the palaces and the gardens only. A special permission is required. Yes. Taken on a short leash, your dog is welcome to join you. Please note the one exception: dogs are not allowed in the Secret Garden (“Jardin secret”): Here, we kindly ask you to leave your dog outside. By the way: Everybody else will thank you for disposing of your dog’s waste in one of the 100 litter bins that are provided all around the grounds. Are dogs allowed in Augustusburg Palace or Falkenlust? No. Your dog is welcome to join you on your walk through the gardens and park grounds, however, is not allowed in the palace buildings. Is it possible to order single items from the “Museum Shops” at the Palaces or shop online? Unfortunately not. We do not have the facilities to run a shipping service. You can only purchase souvenirs directly at Augustusburg and Falkenlust Palaces.